Most readers would probably agree that I have not been a huge fan of Zack Gibson. My counterargument is that I try not to play favorites and take a rational approach to analyzing players. Frankly, Zack Gibson has always been a guy who had all the potential in the world but never produced. 11.6 minutes, 7.1 points, 2.7 rebounds, and .8 blocks per game. Shooting 61.8% from the field (64.7 eFG%) and 73% on two point field goals. Offensive rating of 128.8 (team best) with a usage rate of 22.7%. The highest total plus/minus scores since Thanksgiving in very few minutes. It’s early and the sample size is limited but Zack Gibson has been playing phenomenally. Is regression toward the mean possible with extended playing time? Of course, but why not find out? Gibson is not without his flaws. He still has the frustrating propensity to pick up silly fouls (5.9 fouls per 40 minutes). He still shoots the ball a lot (he takes 27.5% of the team’s shots when he’s on the court). He’s still shooting just 25% on three point shots (but who isn’t on this team?). He’s still a lackluster defensive rebounder (12.8 defensive rebounding%) and he’s certainly not a passer (just 1 assist this year). But he’s active on offense and defense and has been extremely productive. He runs the court well in transition and usually manages to find his way to a couple offensive rebounds while turning the ball over less than he has before (TO rate of 6.4%, down from 18% last year). 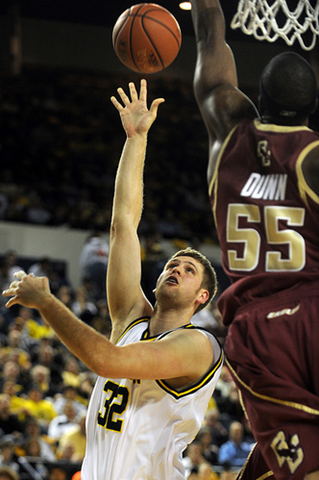 He also has had a positive effect on Michigan’s two point field goal defense because he is the only shot blocker on the roster (7.6 block% compared to Peedi’s 2.9%). Not to mention the fact that Michigan seems to go on runs whenever he enters the game. The biggest question is how to find him minutes. 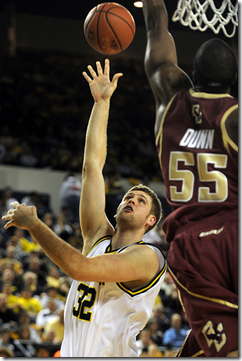 DeShawn Sims has struggled, but Michigan needs Sims to produce, so cutting Peedi’s minutes makes little sense. The obvious answer is to play DeShawn Sims and Zack Gibson together at the expense of Anthony Wright. Wright is playing about 10 minutes per game backing up Zack Novak and Manny Harris. Wright has the worst effective FG% on the team, 31.8%, and simply isn’t producing. By going big when Novak or Harris are not on the floor, Michigan would double Gibson’s minutes, replacing the least productive player on the roster with the most productive. Seems like a win-win. If there was ever a time to roll out this strategy, Wednesday’s game versus a Utah team that starts a 7’3” center and a 6’11” power forward seems to be it.